Thinking about death can cause us to feel a sort of existential angst that isn’t attributable to a specific source. Now, new research suggests that acetaminophen, an over-the-counter pain medication, may help to reduce this existential pain. Randles and colleagues knew from previous research that when the richness, order, and meaning in life is threatened — with thoughts of death, for instance — people tend to reassert their basic values as a coping mechanism. 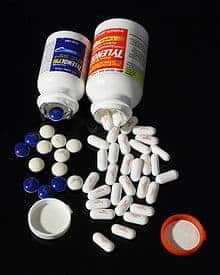 The researchers also knew that both physical and social pain — like bumping your head or being ostracized from friends — can be alleviated with acetaminophen. Randles and colleagues speculated that the existentialist suffering we face with thoughts of death might involve similar brain processes. If so, they asked, would it be possible to reduce that suffering with a simple pain medicine? The researchers had participants take either Tylenol brand acetaminophen or a sugar pill placebo in a double-blind study. One group of participants was asked to write about what would happen to their body after they die, and the control group was asked to write about having dental pain, an unpleasant but not existentially distressing thought. On the other hand, the participants who wrote about their own death and were given a sugar pill gave over $500 for bail – about 40% more than the dental pain group, in line with previous studies. They responded to the threat on life’s meaning and order by affirming their basic values, perhaps as a coping mechanism. But, the participants in this group who took Tylenol were not nearly as harsh in setting bail. These results suggest that their existential suffering was ‘treated’ by the headache drug.